↑ Allan Massie – Madame Proust: A Biography By Evelyne Bloch-Dano, translated by Alice Kaplan Literary Review. ↑ Hughes, Edward J. (2011). Proust, Class, and Nation. Oxford University Press. পৃষ্ঠা. 36–40. ↑ White, Edmund (1999). Marcel Proust: A Life, page 46. ↑ Marcel Proust: Revolt against the Tyranny of Time. Harry Slochower .The Sewanee Review, 1943. Benjamin, Walter, "The Image of Proust," Illuminations, trans. Harry Zohn (New York: Schocken Books, 1969) 201-215. 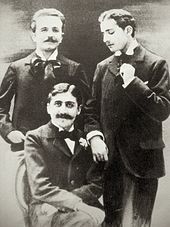 Gracq, Julien, "Proust Considered as An End Point," in Reading Writing (New York: Turtle Point Press,), 113-130. Kristeva, Julia, Time and Sense. Proust and the Experience of Literature. New York: Columbia U. Press, 1996.